This week is going to be great. How could it not be? It has pancakes in it. I look forward to Shrove Tuesday for about three weeks but despite my anticipation I always end up scrabbling around for a recipe on Pancake Day. Along with many other things, I can’t keep it in my head. When I was little my mum had a frying pan with a pancake recipe printed on the bottom of it, although if you get one you may want to make a mental note not to turn it over to check a quantity once you’ve started heating the oil. I think I may have done that. What? That’s how you learn things. 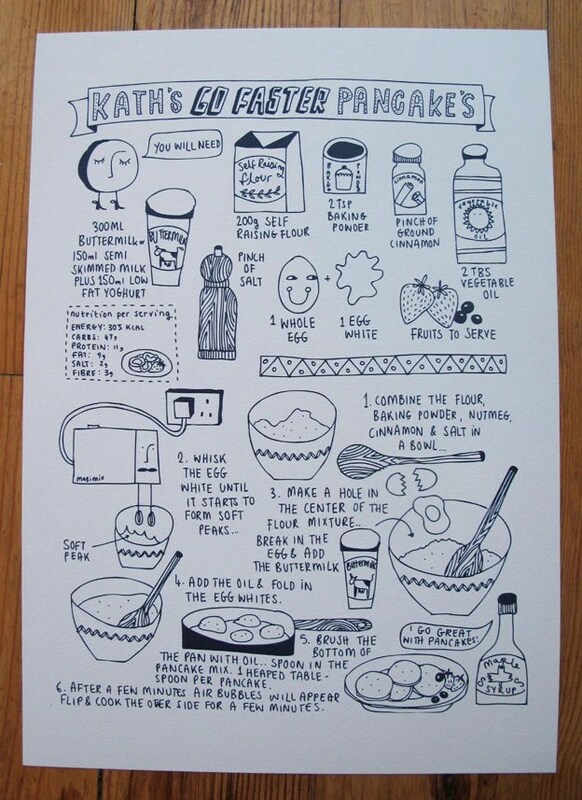 A far nicer recipe prompt is this recipe print for Kath’s Go Faster Pancakes by Etsy seller Kate Sutton. I love the illustrations, the egg’s happy face and the mustachioed electric mixer more than make up for the rogue apostrophe in the title. The recipe looks good too, I’ve never added a whisked egg white but I’ll bet that makes for some gorgeous and fluffy pancakes. Having this print up in my kitchen all year round would definitely increase my pancake making and therefore my happiness. Kath’s Go Faster Pancake recipe recommends serving with maple syrup and fruit but my favourite is the simple yet heavenly lemon and sugar combo. How do you like yours?